Nowadays, Smartphone comes with improved technology in Camera, Battery, Processor, etc. but the main thing people look in a Smartphone is it looks. There are many Android Apps that can enhance your experience and one of them is Best Wallpaper Apps. So, in this Article, I’m going to Share 10 Best Wallpaper Apps For Android – 2018. To give your Phone a new look, you can easily customize your Phone from Changing Fonts to Lock Screen or you can use these Best Launchers For Android to customize your Smartphone. Changing Wallpaper is the Best way to Customize your phone and give it a new look. You can easily Download HD Wallpapers from Google but there are many Best Apps On Play Store which will help you to set new HD wallpapers daily in 1080p. Apart from just a simple wallpaper, there are many cool wallpaper apps for android where you can get 3D Wallpapers, Live Wallpapers, Moving Wallpapers, etc. But, when it comes to 3D Wallpapers & Live Wallpapers, it consumes much battery than a normal one. So, for that, you can check out these Battery Saving Tips or Battery Saver Apps to increase your phones battery life. These Best HD Wallpaper Apps For Android have many categories from which you can choose your favorite one and set it as your Home Screen Wallpaper & Lock Screen Wallpaper. 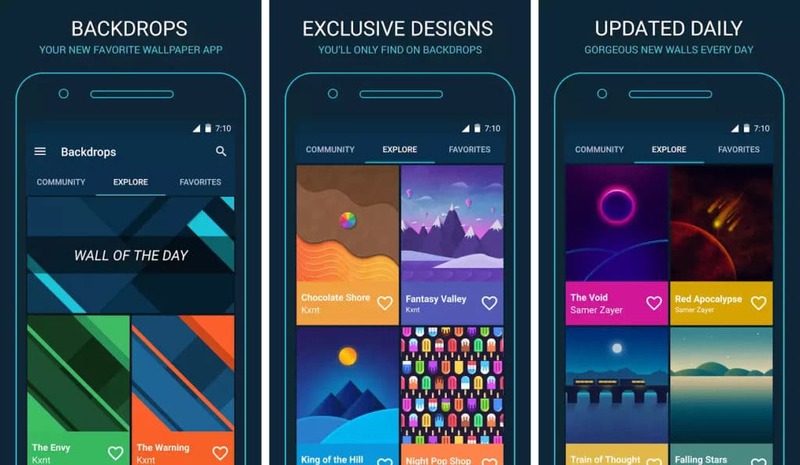 So, let’s proceed further and check out these 10 Best Wallpaper Apps For Android – 2019. Backdrops is one of the Best Android Wallpaper App for your Android Smartphone. This Wallpaper App will give a new look to your Smartphone. It has many sections like Category, Premium, Explore, Social, etc. from where you can select your favorite Wallpaper for your Home Screen & Lock Screen. The Best part about this Wallpaper App is, it is updated daily with new wallpapers and even you can upload your Wallpapers too. It has various categories of Scenery, Geometric, Minimal, Pattern and much more. 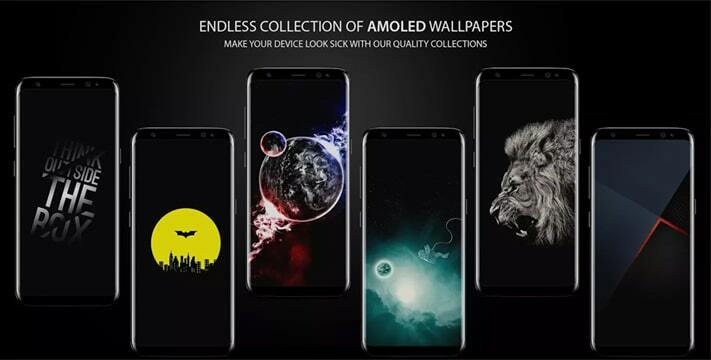 3D Wallpaper Parallax is one of the Best 3D Wallpaper App For Android Smartphone from where you can select various 3D Wallpaper for your Phone. This App gives a complete 3D experience to your Homescreen & Lockscreen. The Wallpapers has multiple layers which help it to give a 3D look. You can also see the preview of the parallax effect before downloading any Wallpaper. Moreover, you can also create your own 3D Theme using your photos. 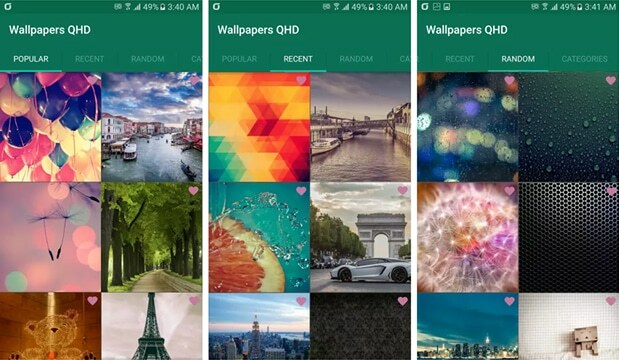 Google Wallpapers is another Popular and Best Free Wallpaper App For Android Smartphone which is owned by Google. It has collections of tons of Wallpapers and you can also access images from Google Earth, Google+, and other partners. You can also Preview & Position your Wallpaper before Setting it. Apart from this, you can select Lock Screen & Home Screen for your Wallpaper and you can also set a daily refreshing wallpaper for a perfect look of your phone. As the name suggests, it is the Wallpaper for the phone with AMOLED Display and one of the Best Background Wallpaper Apps For Android. All the Wallpapers in this App has around 50% black area which will have less battery consumption and will use very less phone’s battery. Moreover, this App will also let you to Set Wallpapers Automatically. You can select Wallpapers from various categories like Nature, Landscapes, Buildings, Patterns, Super Hero, etc. 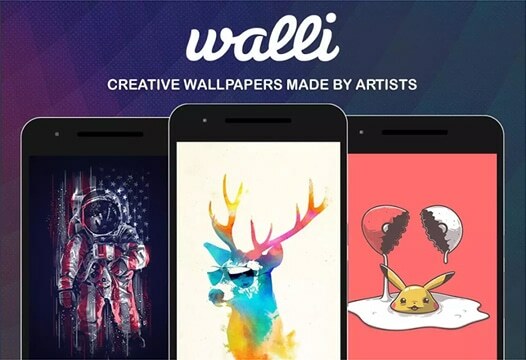 Walli is another Best Free HD Wallpaper App For Android Phone. 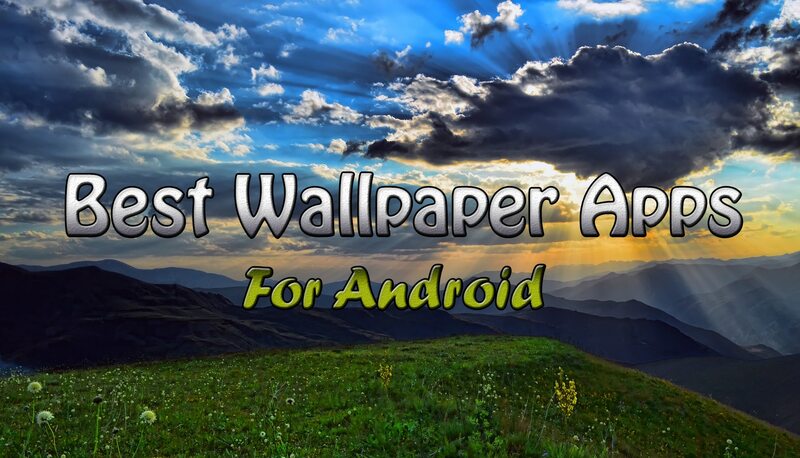 It is a very popular Free Android Wallpaper App on Play Store. It is one of the Top Wallpaper App For Android and has cool wallpapers from the Artist around the Globe. You can get Full HD Wallpapers from this App to set on your Home Screen & Lock Screen. This App has four sections of Category, Recent, Popular and Featured. You can download wallpapers from various categories like Scenery, Photos, Cartoon, Space and so on. Backgrounds HD, a popular HD Wallpaper App for your Android Smartphone where you can Download Best Wallpapers for your Android Device. 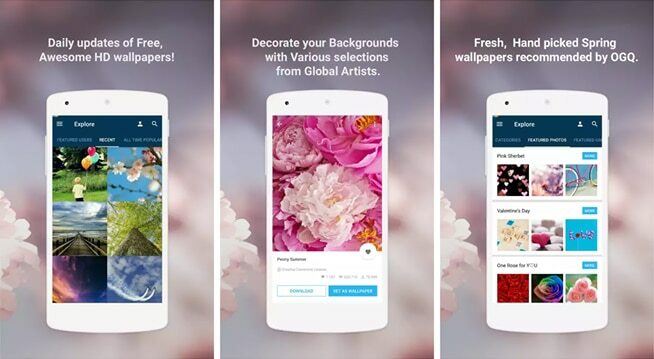 This Background Android Wallpaper App has tons of Wallpapers from the Artist around the Globe and even you can upload your clicked Wallpaper in this App. This App lets you automatically change your lock screen with beautiful images. Moreover, you can post comments and communicate with anyone worldwide. 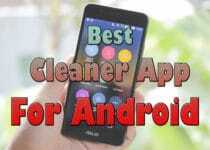 Best Wallpaper QHD is another Best Wallpaper Apps For Android and a very easy to use App and has a good collection of Wallpapers to customize your Home Screen and Lock Screen. When you open the App, you will find four different sections of Popular, New, Categories, Favorites, etc. Wallpapers are of different categories like City, Building, Object, Sports, Food, Quotes and much more. If you are confused between wallpapers, you can go to Random Section and you will get Random Wallpapers everytime you refresh the page. 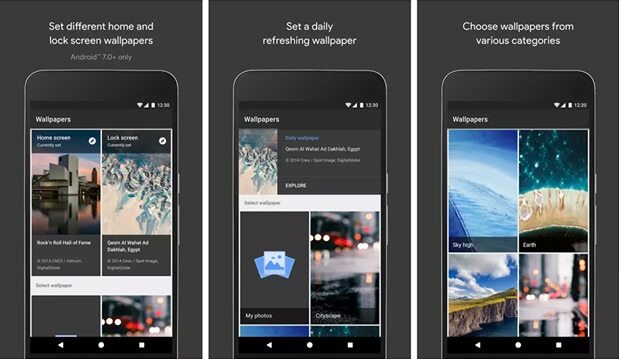 Wallpapers HD & 4K Backgrounds App is another Best Wallpaper App For Tablet and Android Smartphone to give new look to your Android Device. It has over 120K Wallpapers and new wallpapers get added every day. 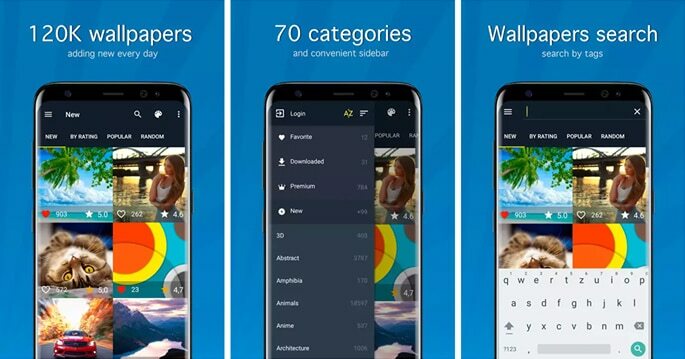 It has over 70 Categories from which you can select your favorite Wallpapers for your Home Screen & Lock Screen. Moreover, you can search wallpapers by their name and colors. Also, you can set the timer for Auto-Change Wallpaper on your Smartphone. 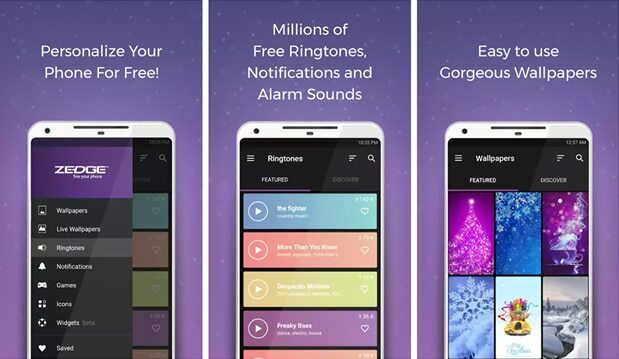 ZEDGE App will help you to easily personalize your phone for free and it is one of the Best Moving Wallpaper Apps For Android Phones. This App is not just a Wallpaper App but much more than that. 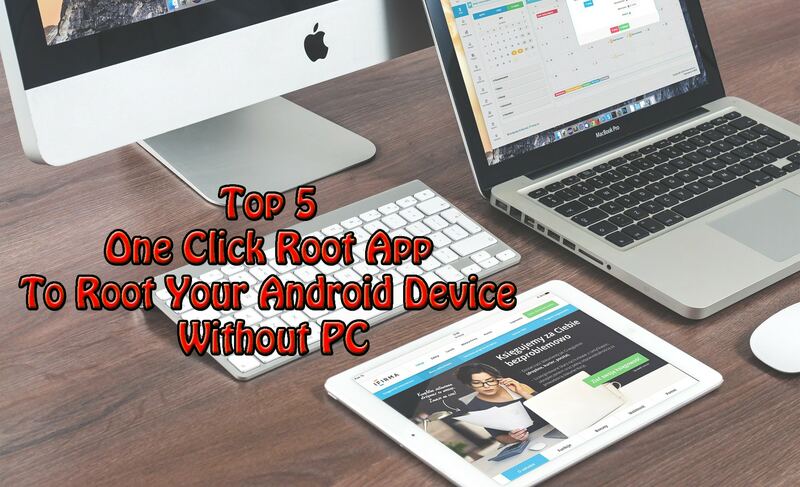 It includes HD Wallpapers, Ringtones, Clock Widgets, Alarm and much more. It has tons of Wallpapers & Ringtones to fit on your Home screen and Lock screen. Enjoy Full HD Wallpapers & Moving Wallpapers for free of cost. 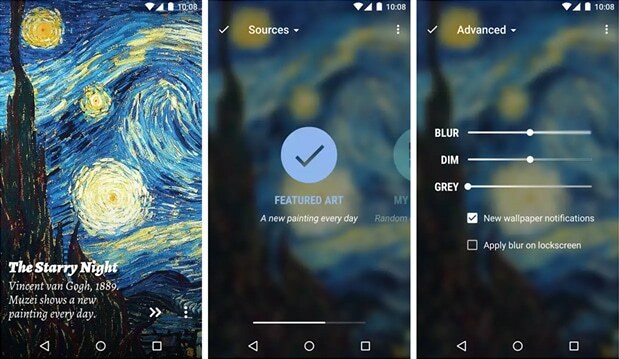 As the name suggests, Muzei Live Wallpaper is one of the Free and Best Live Wallpaper Apps For Android Smartphone to customize your phones Homescreen and Lockscreen. It is the unique and Free Live Wallpaper App which gently refreshes your Home Screen and Lock Screen with new Live Wallpaper every day. On the Lock Screen, you can adjust Blur, Dim and Grey. Though it will consume more battery than a normal wallpaper, its the good one for your phone. Overall, it’s the great live wallpaper App for Android Smartphone. These were the 10 Best Wallpaper Apps For Android – 2019. Apart from this, there are many Best Wallpaper Apps, Live Wallpaper Apps, 3D Wallpaper Apps but here I’ve shared the Best one from them. Also, if you want, you can simply Google your favorite Wallpaper and set it as a Wallpaper but using these Wallpaper Apps will help you a lot. Hope you liked this Article On Best Wallpaper Apps For Android. Do Comment below if you have any query. Stay tuned with us for more latest Tricks & Updates.